Summer is here, and the temperature is going to be very high and can even go up to 45 C, which will affect the lives of many Indian families. In this hot and humid temperature to keep your self cool you can either purchase an Air Conditioner, Tower Fan, Air Cooler or a Ceiling Fan. Air coolers have gained massive popularity in recent times due to the increasing temperature in the summer. Places like Delhi, Rajasthan, Hyderabad, Mumbai are the hottest places in India during the summer. Air Coller are perfect for a Middle-Class Indian family. Air Coller’s cost is less than the Air Conditioners. The power consumption of the Air Conditioners is more as compared to Air Coller, 1-ton AC consumes about 1 Power Unit in 1 hour and 1.5-ton AC can consume 1.5 power Unit in an hour. Most Indians go with Cooler when it comes to keeping their rooms cool. Air Coolers provides cool air which keeps the temperature cool when in use. Air Cooler is better than Ceiling fans as ceiling fans give hot air when the temperature is high. During Hot and Dry summer, coolers are the best effective in getting rid of high heat. Air coolers can bring down to the temperature of the rooms down to 5-6 C. These are inexpensive as compare to Air conditioners and consumes less electricity. Air coolers have a high power fan, water storage and a water pump. When you start a cooler both fan, and water pump works together at the same time. Water pump takes the water from the water storage and throws it on the water soaking wood wool pads. Hot air passing through the cooling pad turns cold, and then the fan blows water soaked cool air from the front opening of the cooler. Air coolers work on the principle of evaporation of water. Air coolers are also known as ‘evaporative coolers’. The air absorbs a massive amount of heat from the environment and gets evaporated inside the cooler, and due to this evaporation, we get cold air from the coolers. Coolers have a water pump that circulates the water from the water storage to three sides of the cooler where wooden wool pads are installed. THese wooden wool pads absorb the water which then cools the air inside the cooler by the process of evaporation. An electric water pump is there inside the Air cooler which continuously supplies the water to the cooling pads from the water storage. The fan pulls the Hot air from the environment inside the air cooler where it passes through the moist wooden wool cooling pads which result in the evaporation of the air inside the cooler. Due to this evaporation, the air inside the cooler turns cold and is then blown out of the cooler by the fans. Wet cooling pads absorb heat from the hot air inside the cooler which results in evaporation of air from the cooling pads. Many people use air coolers to beat the heat of summer. They provide a lot of comfort during the hot summer. Air coolers are cost-effective as compared to Air Conditioner and consume less electricity. Investing in a good air cooler is must if you want to handle the heat in summer. Here is a complete buying guide that will help you in choosing the air cooler according to your requirements. 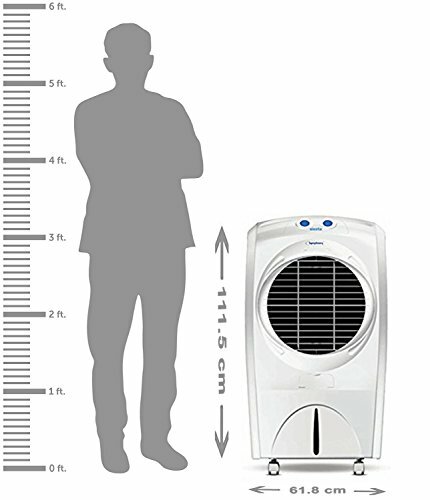 Before purchasing your new Air Cooler, you should keep in mind that the size of Air Cooler matters a lot. Bigger the size of the cooler more cooler air it will blow. A bigger cooler will have a bigger and more powerful fan, large water soaking wood wool pads and large water capacity so that cooler can provide cold air for more duration of time. You should purchase cooler depending on your requirements, size of your room. 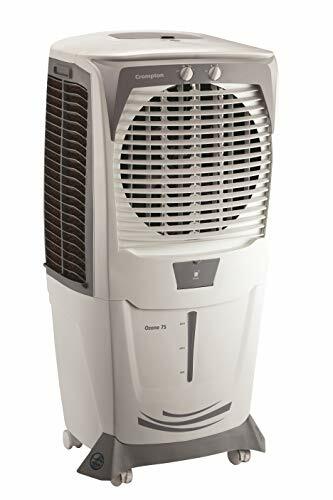 If your room is big, then go for a bigger cooler, and if the size of the room is small, then you can buy a smaller Air cooler. Air cooler should be placed near the window so that cooler gets more hot air from the outside window and if the air is hot than the evaporation of the water will be faster resulting in more cold air from the cooler. You can manually soak the wood wool pads with water so that when you start the cooler, you start getting cold air instantly. You can also add cold water, ice in the cooler to get colder air from the cooler. You need to clean the cooler every 10-15 days otherwise mosquitoes will start breading in the water in cooler resulting in deadly diseases like dengue, a fiver. You can also add some dettol in the water to stop mosquitoes breeding. It is essential to keep the water in the tank clean otherwise you will get the foul smell from the air. Cooling pads must be washed to remove the dust and the pollutants from them. The desert cooler is also known as ‘window air cooler’ as these are mostly installed near the windows. Desert coolers have many different names in different parts of the world like evaporative cooler, swamp cooler, swamp box, desert cooler and wet air cooler. The desert coolers are very popular and are in huge demands among the consumers. These coolers are big and powerful and can be used in big rooms. Desert coolers are usually installed in the windows. Desert coolers take hot air from the outside environment and turn it to cold air by the process of the evaporation or absorption refrigeration cycles. Evaporative cooling is the conversion of the water present in the cooler into the vapours using the hot air from the environments. Evaporative cooling lowers the temperature of the air result of which is the cold air. Evaporative cooling is best for environments where the air is hot, and humidity is low. Cooling performance is unsteady due to variations in temperature and humidity level of the air. Desert coolers have one disadvantage that is they require more space, use more electricity as they are more powerful and consumes more water as they are bigger in size. A room cooler placed inside a room; it takes less space, is less powerful as compared to a desert cooler. Room coolers are best suited for small rooms. These are portable coolers and can be moved and placed anywhere in the house. Room coolers are made of a plastic body to make them look more attractive and are placed on a trolley that helps to move them around which is not possible with desert coolers. They are best suited for bedrooms as they are smaller in size and not much powerful. These coolers have small water storage, so you need to check and fill the water in the tank after some times. Size of the air cooler plays a vital role in deciding on buying a cooler. Big size cooler will give more cold air as compared to a small cooler. If you are planning to use cooler in a large room, then you should go for a bigger cooler. More powerful the cooler is, the more electricity it will use which will result in a more electric bill. So you should check if you need a bigger more powerful cooler or a small cooler will do the work. Air coolers come with adjustable speed settings. With these settings, you can increase or decrease the rate of the fan. It’s a useful feature as you can increase the speed of the fan when the temperature is hot and can reduce the speed when the temperature is cooler like in morning time. Air coolers have 3, 4-Speed settings. Air coolers work on the principle of evaporation. It evaporates the water stored in the water storage tank. If the water storage tank is smaller then, water will evaporate quickly, and the cooler will start producing hot air, so you will have to fill the tank more often. It’s essential to have a larger water tank in the cooler so that you can get cold air for long times. Many coolers come with a remote control so that you can adjust the speed of the fan by setting at your place. This feature comes handy if you are sleeping and start feeling cold and don’t want to disturb your sleep then you can decrease the speed of the fan, or you can simply turn off the cooler. 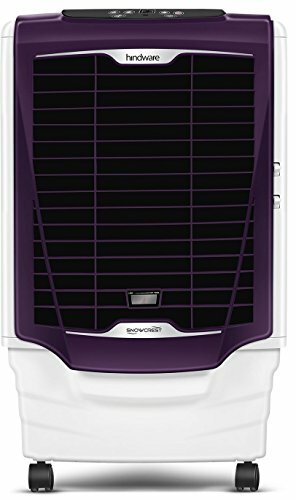 The Crompton Greaves Ozone Air Cooler is a Powerful, Stylish and Smart air cooler. It is a powerful cooler with a power rating of 190 Watts, Operating voltage: 230 V and can deliver air at the speed of 46000m3/ hour. It has a motor overload protection feature. It’s so powerful that it can be used in large rooms sizing up to 5414 Cubic feet. Air throw of the cooler is up to 53 ft which is enormous. The efficiency of the cooler won’t drop while using it in large halls or rooms as it has 4 ways air deflection. It is made of superior quality Fiber which is durable and robust. The durable fibre body of the cooler keeps it rusts free. The cooler has smooth exteriors, which makes it easier to clean. It has a water storage tank of 75 Litres. Water fill up valve is available at the back of the cooler, or you can manually fill the water from the front side of the cooler. A full water tank will last up to 8-9 hours if used continuously. Water drainage tap is present at the bottom of the cooler. Water level indicator also Available. And Ice tray is available at the top of the cooler. Its a Portable air cooler as Castor wheels is present at the bottom of the cooler for easy movability. The cooler has high-quality Honeycomb cooling pads for air suction and better cooling. Cooling pads can be easily removed and cleaned. It has cooling pads on 3 Sides which enhance the performance of the cooler during the high summer. The cooler has a 3 Way speed controller for adjusting the speed of the fans. The air cooler is compatible with Inventer. The Symphony Siesta Air Cooler is a Powerful, and Smart air cooler. It is a powerful cooler with a power rating of 160 Watts, Operating voltage: 230 V. Symphony Siesta Air Cooler has a Specially designed front grill which delivers the maximum amount of air. The cooler has an Automatic vertical swing. The body of Symphony Siesta Air Cooler is made of Thermoplastic which is durable and robust. The body of the cooler is rust free. Symphony Siesta Air Cooler has a water storage tank of 70 Litres. You won’t have to fill the cooler very often 70 litres of water will last 2-3 days for you. The cooler doesn’t have Ice chamber. The cooler doesn’t come with remote control. Mosquito net / Dust filter is present in the cooler. 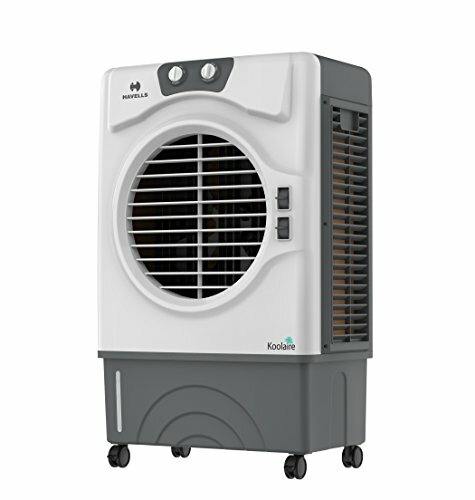 Havells Koolaire is an innovative air cooler with unique features like completely collapsible louvres, 3-side washable dust filter nets, water tank cover, auto drain, humidity control, temperature display, cord winding station, 3 sides honeycomb cooling pads & low operating noise. 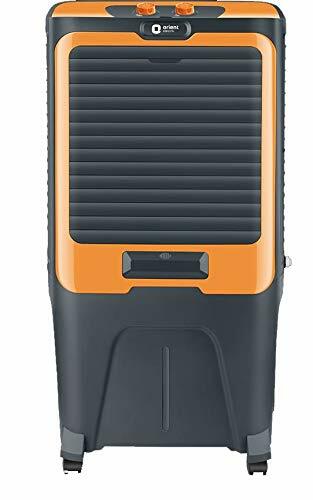 The Havells Koolaire Air Cooler is a Powerful air cooler with a power rating of 220 Watts, Operating voltage: 230 V.
Havells Koolaire has 5 leaf aluminium blades that deliver powerful air at the delivery speed of 3200 m³/h for active cooling. Auto swing capability ensures multi-directional airflow & cooling. Vertical louvres are motorised control & horizontal louvres are manually control for the ease of air flow direction setting as per user requirement. Havells Koolaire Air Cooler has a water storage tank of 51 Litres that will ensure cooling for longer durations. The cooler doesn’t have Ice chamber. Havells Koolaire cooler has a 3 Way speed control setting for adjusting the speed of the fans, air delivery and cooling. The air cooler is compatible with Inventer. Water level indicator is present on the cooler for ease of re-filling water in the cooler. Thermal Overload Protection protects the motor from overheating by cutting the power supply thereby ensuring motor durability and safety. 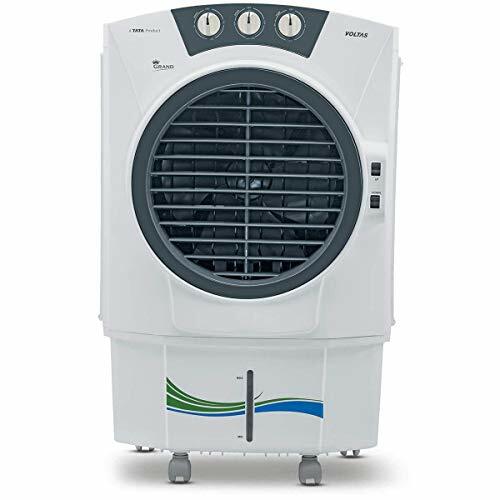 The height of the coolers fan is at the bed height which allows maximum airflow towards the user; the fan is above the bed height to avoid air flow getting restricted. 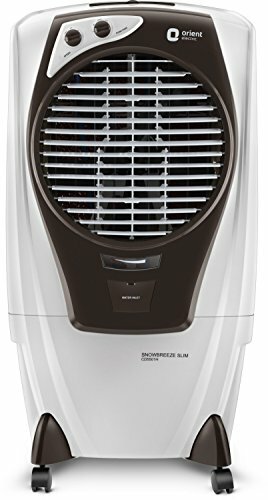 Havells Koolaire has a 3-side washable dust filter net that prevents dust and insects from entering the air cooler, prevents the breeding of mosquitoes. Havells Koolaire has especially processed Honeycomb Cooling Pad. This air cooler has anti-bacterial, anti-corrosion, anti-deformation honeycomb cooling pads along with hydrophilic properties, which absorb the dust particles and cleanse the air thoroughly. These are long-lasting cooling pads with low-maintenance. Wood Wool Pad option is also available for choice of customers. Havells Koolaire has fully Collapsable louvres that don’t allow Dust & insects to go inside the cooler. The auto drain system is present on the cooler so that you can remove the old and dirty water from the cooler if the foul smell starts coming from, the cooler. 360-degree rotational castors are present at the bottom of the cooler for smooth movement. Front castors have brakes for safety and to stop undesired movement during the operating of the cooler. The Hindware Snowcrest Air Cooler is a Stylish, Powerful and Smart air cooler. It is Indias first Air Cooler with changeable colour panels. Hindware Snowcrest Air Coolers come with Colourful Front Panel – Brick Red/Ice Grey Colour Panes. Hindware Snowcrest Air Cooler comes with unique features like remote-controlled operation, digital display panel, anti-skid top cover, shut louvres and power packed performance. Hindware Snowcrest Air Coolers is equipped with Powerful Fan, Highly efficient motor and smartly designed louvre mechanism that guarantees higher air delivery to cool any space in your house. The RPM of the Fan 1350. 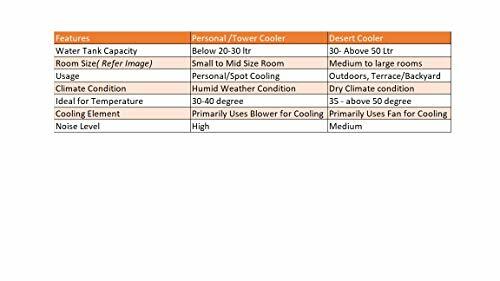 Hindware Snowcrest Air Coolers has a power rating of 190 Watts, Operating voltage: 230 V. The cooler has 4 way Air Deflection. Hindware Snowcrest delivers powerful air at the delivery speed of 3800 m³/hr for active cooling. Air Throw Distance 12 m.
Hindware Snowcrest comes with a remote control which allows you to stay at one place while you enjoy the cool breeze from the cooler. Honey-Comb Pads are present at the back & side grills, honey-comb pads ensure better cooling in a room. These are low maintenance cooling pads which are designed in such a way that they will absorb dust particles, are anti-deformative & anti-erosive which ensures longer life. Top of the cooler is Anti-Skid and Anti-slippery which provides additional grip & storage for placing objects on the top of the coolers. Ice Chamber is present which enhances the cooling efficiency of the cooler. Hindware Snowcrest Air Cooler has a water storage tank of 60 Litres that will ensure cooling for longer durations. The cooler has an AutoFill feature so which allows the user to fill the water tank automatically by attaching the cooler to a direct water supply tap. Water Level Indicator warns you about the low water level in the storage of the cooler. This assures that you do not run out of the water unexpectedly. Stay cool even without electricity. 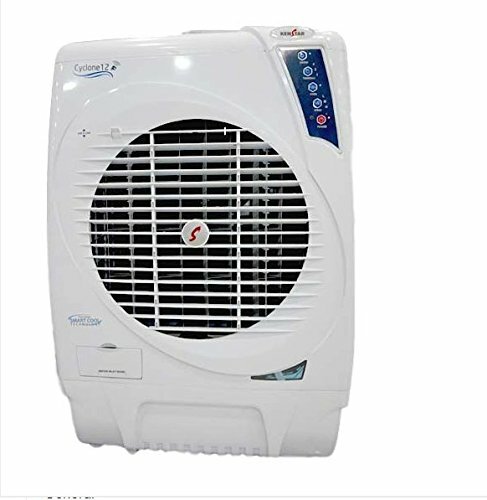 Hindware Snowcrest Air Cooler is Compatibility on Inverter. The cooler has a 3 Way speed controller for adjusting the speed of the fans. Castor Wheels helps in the easy portability of the cooler. Orient Electric Ultimo Air Cooler is an Energy-efficient and power packed Air cooler. It comes with exciting features like Uniform Flow Dispenser, separate Ice Chamber and Motorised Louvers. It is a powerful cooler with a power rating of 190 Watts. Aerofan Technology is used for long Air throw and can deliver air at the speed of 3650 Cu.m./ hour. Air Throw Distance is 60 ft. Size of the fan is 16 inch. Water tank capacity is 50 Liters that will last for at least 2 days. Orient Electric Ultimo Air Cooler has an AutoFill feature so which allows the user to fill the water tank automatically by attaching the cooler to a direct water supply tap. Honey-Comb cooling pads are present at the back & side grills, honey-comb pads ensure better cooling of the room. Water Level Indicator will warn you about the low water level in the storage of the cooler. Ice Chamber and Fragrance Chamber are present which enhances the cooling efficiency of the cooler. In Fragrance Chamber you can put some fragrance which will make the environment pleasant. The cooler will prevent the Mosquito Breeding, Water storage tank is Anti Bacterial, and an Anti Bacterial Filter and a Dust Filter is present on the cooler. Specially designed castor wheels enable the cooler to rotate 360 degrees. This feature makes it so much easier to move the cooler around the house. Voltas Grand 52 is a 190 Watt powerful air cooler with Air Flow of 3400 Cubic m/h. The cooler has a Large fan size; Motor Speed is 1440 RPM that can cool large space. Honeycomb Cooling Pads is used which provides uniform cooling of the room. Voltas Grand 52 Air Cooler has a 3-speed control setting low/medium/high for adjusting the speed of the fans, air delivery and cooling. Water tank capacity is 52 Liters that will last longer. Water level indicator is present on the cooler so you can check if its time to fill the water in the cooler. The cooler has high-quality Castor Wheels for easy portability. The cooler Works on Inverter. Three Side Honeycomb Cooling Pads are used in the cooler for better cooling. 4 Way Air Deflection System provides better air circulation and cools down the environment efficiently. Usha Maxx Air cooler has a 3-speed control setting low/medium/high for adjusting the speed of the fans, air delivery and cooling. Water tank capacity of the cooler is 50 Liters which will last longer. Water level indicator is not there on the cooler, so you have to check for the water left in the cooler manually. Memory mode and smart sleep functions are there on the cooler. There is a timer on the cooler. You can set between 1-8 Hours of the timer. A digital control panel is there on the cooler. The cooler features a child lock feature so your child can play safe near the cooler. Orient Electric Snowbreeze Slim is available in White/Dark Grey colour. It is a very powerful air cooler with a power rating of 200 W. The cooler has a large, powerful fan blade that can throw air at the speed of 3000 m3/hr. The air throw distance is 37 sq mts or 400 sq. Ft. High-performance motor is used for better performance of the cooler. The body of the cooler is made of ABS. 4-way, 360Degree cooling, motorised vertical & horizontal louvers are there in the cooler. The cooler Cools up to 37 sq mts or 400 Sq — Ft of room. Water tank capacity of the cooler is 55 Liters which will last longer. Autofill feature is there for hassle-free filling of the water storage tank. Ice chamber is there for quick cooling of the environment. Densenest Honeycomb Cooling Pads are used in the cooler that helps in 25% more cooling & 45% more water retention. 3-speed control setting High/ Med/ Low for adjusting the air flow from the cooler. 3 Operating Modes are there Normal, Natural, Sleep. The cooler is compatible with Inverter so you can enjoy uninterrupted cooling during power cuts in summers. Water Level Indicator will warn you about the low water level in the storage of the cooler. Water Overflow Indicator is there on the cooler. Castor wheels are present at the bottom of the cooler for smooth movement and portability. Kenstar Cyclone-12 is a stylish looking powerful air cooler with the power rating of 190 Watts. It has metal fans; blades have Diametre 40.64 cm. The RPM of the motor is 1400. Air delivery speed is 0.83 m³/s. Water storage is of 51 Liters which will last for many days. Ice chamber is there in the cooler so you can add some ice to cool down the temperature of the room quickly. Mosquito and dust filter is there in the cooler, so you won’t have to bother about mosquito breeding in the air cooler’s water. This filter will prevent mosquitos, small insects and flies from getting into cooling pads which helps in keeping the air cleaner. Water level indicator is there so you can quickly check the water level in the water tank effortlessly without opening the cooling pads. The air cooler works on the inverter thus giving you comfort even during a power cut in the harsh summers. Honeycomb cooling pads are there in the cooler which is more durable than the traditional cooling pads and thus gives freedom from changing them frequently. You can also opt for Woodwool cooling pads. 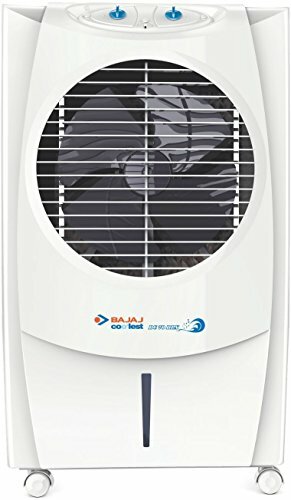 This Bajaj air cooler a Powerful, Stylish and Smart when it comes to design. It is a powerful cooler with a power rating of 200 Watts and can deliver air at the speed of 5600m/hour. It’s so powerful that it can be used in large rooms sizing up to 600 Sq Ft.
Water tank capacity is 70 Liters which is more than enough. The cooler has Honeycomb cooling pads which can be easily removed and cleaned. It has cooling pads on 3 Sides which enhance the performance of the cooler. The cooler has a Castor wheel so you can quickly move it around in your house from one point to another. It has four-way air deflection with air throw of 80 feet. It has a 3 Way speed controller. The coolers operate smoothly and make no sound at all. There is an Ice chamber so you can put ice during high temperature. The Bajaj DC 70 DLX Cooler works perfectly with inverters.